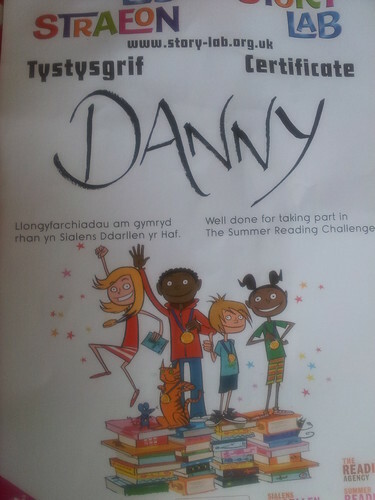 Well that will teach me to blog about how good the free, summertime activities are at the local library! Last week it was fully booked and for the first time ever, I couldn’t get a place! I am glad to see it’s doing well, but a shame we missed it as it was about “Myths and Legends” which we love and I think they were going to make Dragons, another favourite of ours! Danny collects Mythical Creatures (well models of them, not real ones as they’re not real obviously!). By the way, I know the interesting topic and the weather were really more to blame for the library being full rather than my blog post! 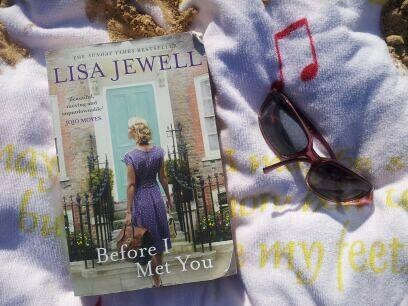 We still popped to the library anyway, as we needed to change our books and after reviewing “Before I Met You” by Lisa Jewell for the Tots 100 Summer Reading Challenge, I really wanted to pick up some more of her books to read. 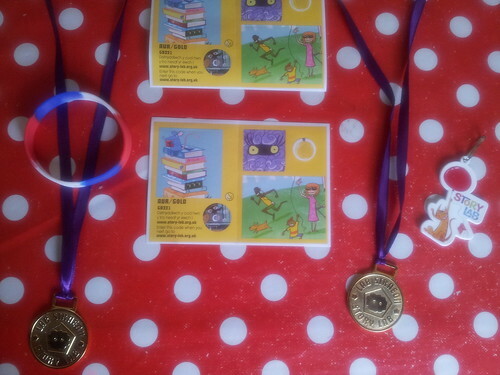 Danny and Rebecca wanted to return their books as they had completed their Summer Reading Challenge and were presented with their Gold Medals! 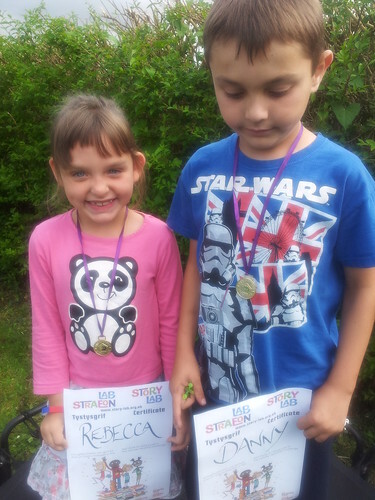 They felt like they were Olympic Champions! 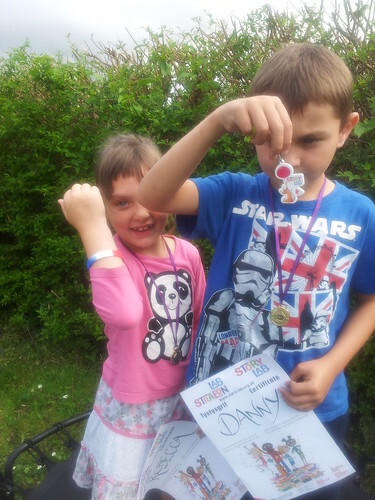 Danny and Rebecca wearing their medals. 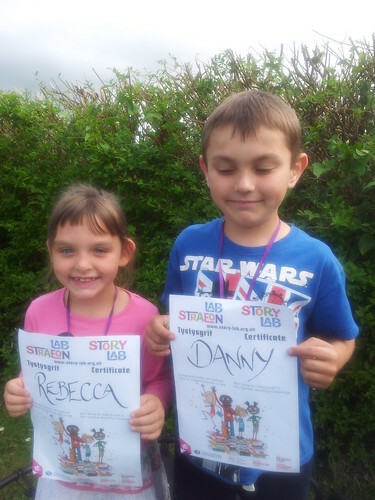 Danny chose a keyring and Rebecca chose a band as free gifts for completing the Reading Challenge. Holding their certificates. Lovely to see Rebecca’s front teeth coming through! She has lost lots more though…still keeping the tooth fairy busy this Summer. The poor tooth fairy is nearly skint now! With their band and keyring. I love Rebecca’s pose here! So, thank you to Story Lab. 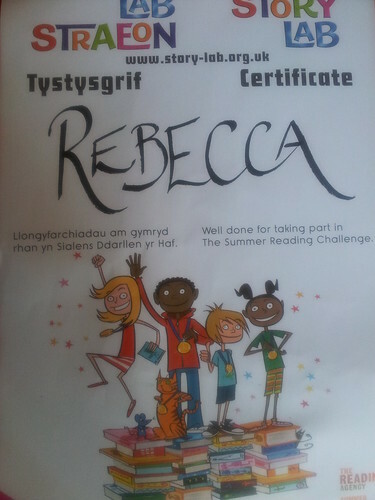 They really enjoyed taking part, reading lovely books and getting their rewards. We have two more library sessions left (if I can get a place!). Danny won’t be able to make them though as he is out and about on trips with Activity Extra. 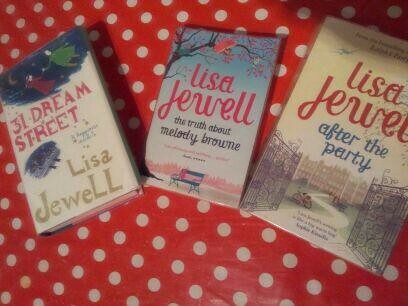 The girls and I are off to the Library tomorrow while he goes to the Cinema (again! We were all there today too!) then bowling. Later we are all going to our local amusement park, Oakwood, for After Dark and fireworks. Should be fun! 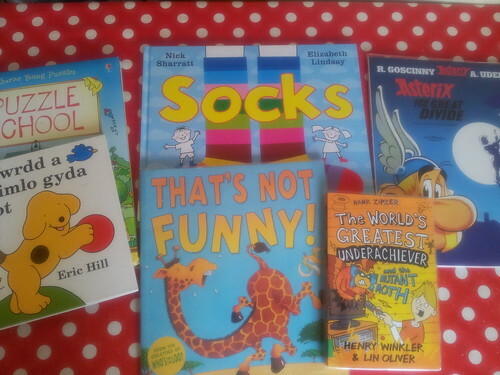 Hope everyone else is enjoying Summer Holidays? Please tell me that your houses are a mess and you are exhausted too? !